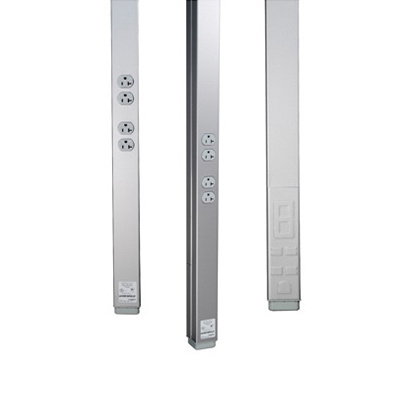 Wiremold Tele-Power® Factory wired pole has a voltage rating of 125-Volts and current rating of 20-Amps. The two duplex receptacle pole with two outlets, is compatible with #12-AWG THHN conductors. The pole in ivory color, has steel construction for high strength and durability. It measures 2-5/16-Inch x 2-1/4-Inch x 10-ft 5-Inch. It features dual-channel to accommodate electrical power circuits plus receptacles and low voltage cabling. The pole has (19) unshielded twisted pair Category 5, (47) two pair telephone cable, (24) Rg58/U coaxial cable, (8) 100-Ohm twinaxial cable and (6) type 1 shielded twisted pair for wiring. It comes with (1) communication insert mounting adapter, (1) dual Category 5E insert and (2) blank insert and labeling supplies. The pole meets UL and cULus standards.